Tuesday 30th January - Round-the-Block road race at 12:30 at Cranford. See below. Course to be shown on map next week. Meet in the car park of Cranford Community College anytime after 17:30. Arrive ready to run or use the college changing rooms to get changed. The accurately measured five mile course starts from just down the road towards the Queen's Head (near the second zebra crossing). Steve will organise your departure time with the objective of being back for 19:00. Change and shower at the college, and then drinks and food at the Queen's Head - please note that the BA Clubs discount has now been reduced to just a token 5% so it doesn't make much difference whether you remember your light blue membership card or not. The start time for this event is 10:30 from next to the small car park in Cranford park alongside the church. The car park is accessed from the "Field of Hope" (M4/Parkway) roundabout. The car park is small so where possible please car share or park somewhere else nearby and walk to the start. The course is flat and run on a mixture of grass and wooded paths. It normally consists of a lap of 1.5 miles and the men's event is judged over three laps and the women over two (with an optional third lap for the keen ladies). The leading male and female club runners are jointly awarded the club's Cross Country trophy. All volunteers on the day will be found useful tasks to do so please make yourself available and preferably email Gary to say that you'll be coming - we would prefer all "able bodied" members to be able to run rather than be pressganged into marshalling on the day. The club has had a "Round-the-Block" race around the streets of Cranford and Heston since the early 1980s and we've no intention of stopping now. Indeed I've announced that if necessary I'll act as course setter, starter, pacemaker and timekeeper, if I'm the only attendee. Hopefully though some of you will be able to join me, as a generous lunchtime break from your work locations, or from your retirement cottages. Over the years the course has been the same other than we've slightly varied the start and finish location and therefore the distance between them. In the early '80s the course was one full lap starting and finishing on the green just the south side of the Motorway bridge where Cranford High Street becomes Southall Lane. We'll do the full lap this year, which I've GPS measured at 3.4miles/5.5k, and either start at that green or nearby. I'll update the club map with the course after Wednesday's Five Mile Handicap event (the two courses overlap somewhat). Note that we have no daytime access to either the Heston Venue or Cranford Community College so participants will need to arrive ready to run and return whence they came to shower and change afterwards (perhaps via the Queen's Head first). Traditionally we charge £1 for participation in this event and this is donated to White Lodge. Please attend and encourage your friends and colleagues to join us also. Non-runners also welcome - I don't want to be starter or timekeeper! Advance notice that this year's British Airways Athletics Club Annual Awards Ceremony will be held on the evening of Wednesday February 28th at the Five Bells pub in Harmondsworth. Food will be available on the evening - details to be provided nearer the time. There will also be a club run beforehand, again details to be provided. Please attend this evening if you can - you may not consider yourself to be in line for an award...but you never know! Each year we present around a dozen trophies and awards to the club members who have achieved or contributed the most over the previous year. The 2016 and previous year's recipients for each trophy are listed here (www.barunner.org.uk/News_Trophies.shtml) on the website. IMPORTANT: Could the current holders of each trophy please return them to a club committee member such as myself, Steve Hillier or Neil Frediani - for instance at the club events this Wednesday and Sunday. We need to get the trophies inscribed with the names of the 2017 recipients. The nasty damp chilly weather continued for another week but that didn’t deter nine of us joining in to be part of what turned out to be a record attendance of 358 at Northala Fields. Ian Cunningham (22:25) was our first member to finish. It was his first run at Northala, everyone else had been there at least once before. Alan Anderson (32:33) was running there for the first time as an 80+ year old and indeed it was only the second run ever by a male octogenarian at Northala. The impressive record of 26:05 is held by Dennis Wraight of Ealing, Southall and Middlesex AC. Alan Anderson is now on 492 runs and on target to run his 500th at Gunnersbury on St Patrick's Day, 17th March. England have a rugby fixture with Ireland at Twickenham in the afternoon so it could be quite a day. Brentford are due to play Middlesbrough at Griffin Park if you are of the other persuasion! Julie Barclay (22:49) was first female across the line at Frimley after an excellent run where she saw off the competition and got close to her pb and club course record of 22:28 set last year. Dave Dixon (18:01, 83.9%) came out of hibernation early at Hackney Marshes, in previous years he has never appeared at a parkrun before Easter! Adrian Haines has been our quickest so far, though with a lower age grade, with two sub-18 runs at Tilgate (best 17:37, 83.7%). Richard Ruffell (21:55) is still on the tourist trail (Finsbury Park) and took his personal tally to 73 different parks. Richard is one of several members who have taken all five parkrun opportunities so far this year. The others with a perfect score are Bob Bannister, Ian Cunningham, David Duggan, Roderick Hoffman, Chris Kelly and Trish McCabe. No pressure guys, you are allowed an occasional holiday. Trish McCabe has already recorded a run in Australia and David Duggan has plans to do the same over the coming weeks. The current Chief Executive Officer of parkrun is Nick Pearson. Approaching the finish of this week's Bushy parkrun he realised that something was wrong. Shock, horror! He didn't have his parkrun barcode on him. Now, he could of finished and come out with a "Don't you know who I am?" argument...or he could have sneaked off quietly and not let anyone know...but instead he posted to social media to admit his schoolboy error/senior moment (delete as applicable) and a reminder that the parkrun rule is "no barcode, no result, no exceptions" (or, as they say on social media: "#dfyb"). Also to be remembered is the efforts of the volunteers that enable these runs to happen. Someone calculated this week that their 100 parkruns had been made possible by the combined efforts of a team of 1,104 volunteers. Think about that the next time you hear a parkrun volunteer request (or seek one out if you don't already get these). This club has within its ranks some members who get volunteer credits almost every week but there are others who could probably do more. Many efforts can be achieved without giving up your run - indeed four of the six runners listed by Steve above as having parkrun at every opportunity so far this year ALSO have at least one volunteer credit this year. Different volunteer roles will appeal to different people - one I find easy and enjoyable to do is that of Run Report Writer - my latest effort should appear on the Northala Fields News page shortly: http://www.parkrun.org.uk/northalafields/news/ (you might even have got a mention in it!). 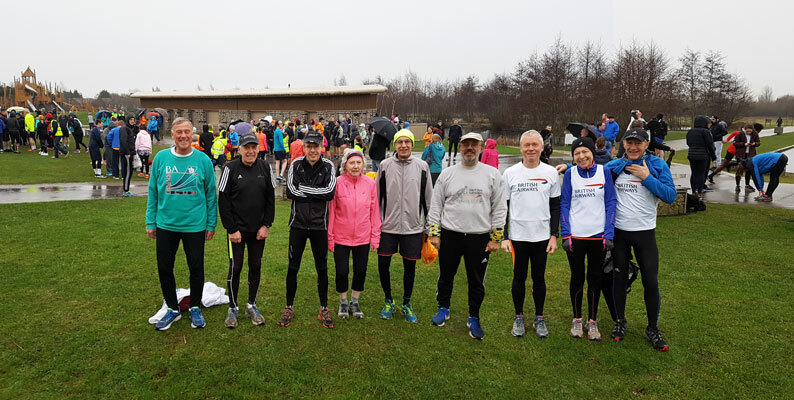 Bressay in the Shetlands had its inaugural parkrun on Saturday and there were 65 attendees including about 17 runners who had braved the weather and conditions to get there from other parts of Scotland and the UK. Given that 22 of the other 34 Scottish parkruns were cancelled due to the weather they must have been pleased they risked the journey. Overall over 100 UK parkruns were cancelled - this map shows where the cancellations occurred: Google Map of UK parkrun cancellations 20th Jan 2018. The latest parkrun stats reveal that there are now currently 500 UK parkruns listed as active (a couple of these are yet to start, but at least three UK parkruns have ceased operation over the years). Of these 500, club members have run at about 306 or just over 60%. Overall there are now in the region of 1149 parkruns worldwide, and of those we have run at 376 or around 33%. We've yet to run at the single parkruns in Norway or Finland. I predict both countries will be ticked off later on this year but new parkrun countries will appear - I've seen rumours of Malaysia being on the way. Our next lowest participation area is South Africa where members have only run at 7 of the 128 parkruns available (5%). Interestingly the seven SA runs were each run for the first time by seven different club members! Much of the source data for such stats is in Steve's club stats spreadsheet AND is currently up-to-date on the club map [Clickable link to Google Maps] . Sat. 20th Jan. Julie Barclay wanted to return to Frimley Lodge after a year and try for a PB. When she arrived and saw the muddy conditions said, “I am still going for it”. Paul Watt and myself stood at the 400m mark able to see the runners 4 times. Julie was leading lady at 400m with two younger girls breathing down her neck and still leading after the 1st lap after dropping one girl. Then with 600m to go, not sure if Julie was running faster or the other girl faded but the gap between them was a greater distance and knowing Julie’s determination no way was any one going to pass her and with Paul's verbal encouragement Julie’s leg strength was more important than her speed and finished 1st lady in 22.49 missing her PB of 22.28 but her performance was more important. Ed: The "younger girls" were running in the VW40-44 and SW20-24 categories so might have described themselves differently than Tom did. Julie got the second highest age grade on the day - behind Mark Symes VM45-49 who finished in 18:11.